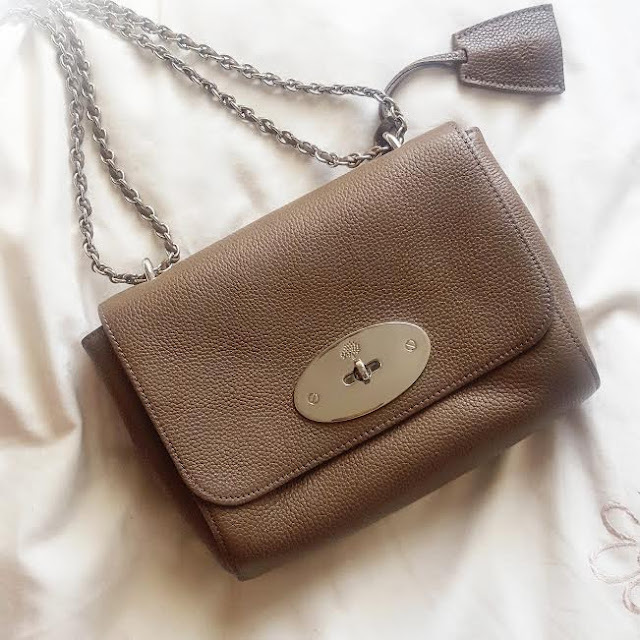 The small Lily Mulberry bag, is the second smallest of the Lily family and I was actually torn between the Small and the Medium but when I looked at the medium on someone I actually thought it looked quite big and I just didn't want that. As you can see I don't actually own a purse, I have my Lulu Guinness card holder which got years ago from my parents as a Christmas gift and I have a little Coach coin purse which I bought last year. 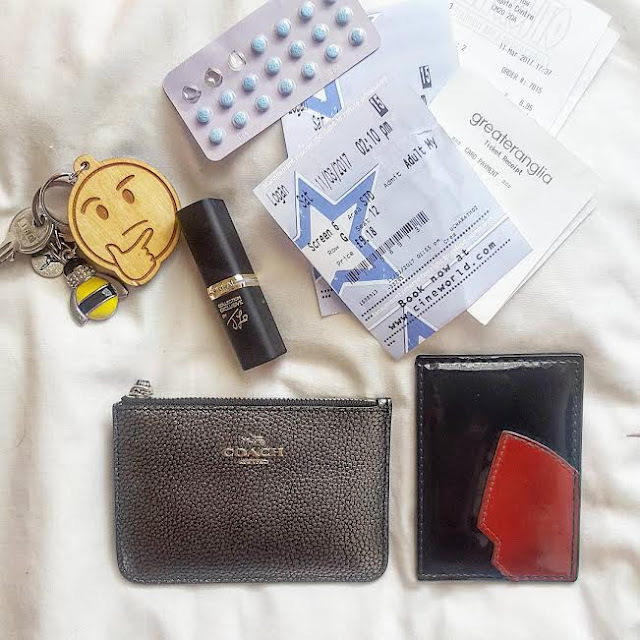 The thing is, I actually don't like carrying purses and rarely carry cash on me which is why I find it easier to have these small leather items because I can't take out of my bag only what I need at the time. 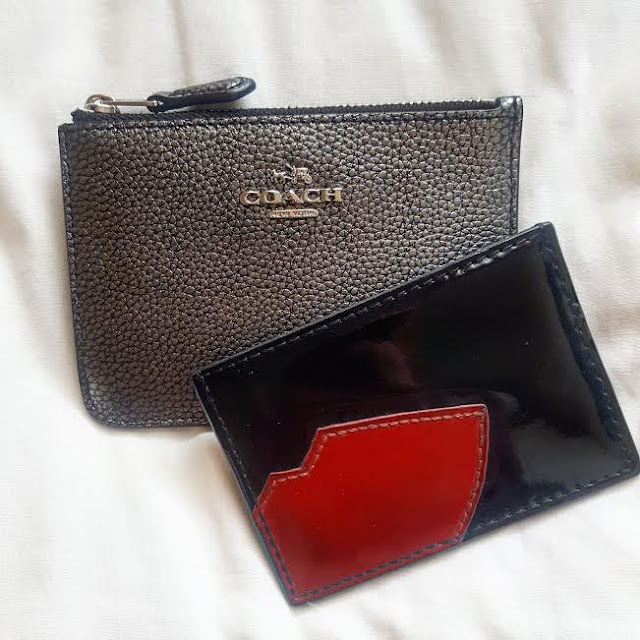 You've probably seen a lot of bloggers with the Saint Laurent card holders which retail for around £150 but my Lulu Guinness one was only about £50 and I know there are loads of other brands that do a slightly lower price but still have a luxe feel about them so do a bit of hunting. The same goes for my Coach coin purse (which I can't find online) but it was actually a key holder but I bought it in Macy's for $50 because it was in the sale. Onto the boring stuff, I carry my keys, which again I only have 2 key rings on, one is a Queen Bee because, I mean, I am! The other is a in joke with me and the geek. Then we have my pill, I'm pretty forgetful so always having it in my bag is handy. I have a lipstick, receipts, cinema tickets, blah blah blah! I can also fit comfortably my phone in here as well as my his glasses case on occasion so actually it's a great size for me. I will admit I don't carry a lot in my bag but that is just genuinely what I am like, even in bigger bags there isn't that much more, maybe an umbrella and more receipts to be honest! Do you prefer small or big bags?